A winning proposal begins with a solid capture strategy—the primary goal being to increase the Probability of Win (P-Win) to justify investing resources in a sales pursuit. All organizations have limited resources (people, time, and money) and must carefully identify which opportunities offer the best chance of becoming new business. Once the decision is made to pursue an opportunity and craft a proposal, the strategy then changes to developing persuasive messaging. A proposal is more than a technical solution. Like a public speaker, it must have substance and also be interesting. Proposals that thoughtfully address each of the questions outlined in the five categories below tell a compelling story of why an offer should be selected. • Is the proposal 100% compliant with the RFP? • Did we provide a response matrix that is mapped to the bid request? • Do we have a compelling value proposition that explains to the customer how we are going to improve their business or mission? • Do all sections tie benefits to the customer’s requirements and needs? • Is it obvious in the Executive Summary and proposal sections why our offer should be selected? • Are win themes obvious and woven throughout the text? • Are theme statements specific, factual, and quantified when possible? • Are theme statements, action captions, and informative headings consistent in structure and placement? • Are discriminators prominent in themes, captions, headings, callouts, and summaries? • Have we “ghosted” the competition? • Has each section been story boarded before writing? • Is writing customer focused, organized, clear, and correct? • Do sections use the “top-down, four-box approach? • Are summaries and introductions used at all levels? • Are paragraphs six lines or less? • Do all sentences have a maximum of 15-20 words? • Did we brainstorm visuals before writing? • Are there impactful visuals on each page? • Do all visuals have action captions? • Is the 10-second rule applied? • Do pages “read short?” Are they easy to read and comprehend? • Is the proposal professional and easy to evaluate? • Does key information stand out? • Is there a proper balance of text and visuals? 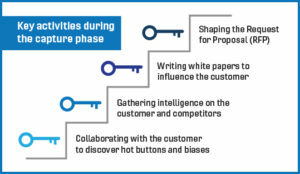 By focusing on the five key characteristics outlined above, proposal teams can achieve greater customer focus and consistently win more business.